Someone’s not monkeying around. Today, Syfy announced the fourth and final season of its 12 Monkeys TV show will premiere on Friday, June 15, 2018. Check out the teaser, below. Last year, season three aired in rapid fashion, over a three day period. The cable network is loosening up somewhat, this year. The airing of the 10 episodes of 12 Monkeys season four will also be condensed, but into four weeks rather than three days. Only the June 15th premiere date is known. When Syfy releases more about the timeslot(s) and subsequent dates, we’ll let you know. 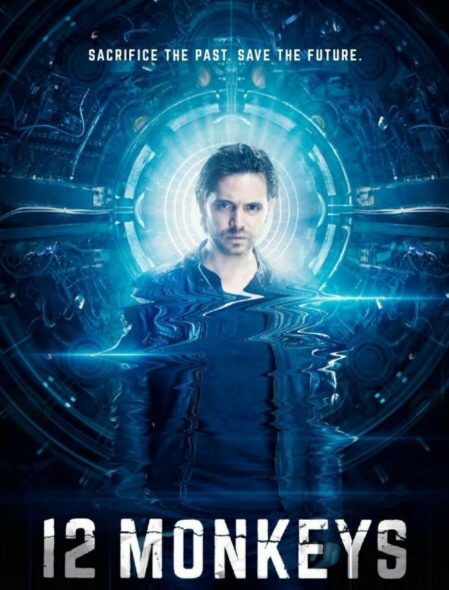 A Syfy science-fiction mystery, 12 Monkeys stars Aaron Stanford, Amanda Schull, Kirk Acevedo, Todd Stashwick, Emily Hampshire, and Barbara Sukowa. The drama series follows James Cole (Stanford), a man from 2043, who is sent back in time to stop the evil Army of the 12 Monkeys from destroying the world. In the fourth season, Game of Thrones‘ Conleth Hill guest stars as Bonham. His character is “a world weary international law enforcement agent facing the last days of mankind,” according to Syfy. What do you think? Do you plan to watch the fourth and final season of the 12 Monkeys TV series? Is it ending at the right time? If it were up to you, would Syfy cancel or renew 12 Monkeys for season five? Tell us. 12 Monkeys on Syfy: Cancelled or Renewed for Season Five? 12 Monkeys: Cancelled or Renewed for Season Four on Syfy? I definitely plan to watch – really wish it wasn’t ending! I agree with Cazlyn, everything this person said is exactly how I feel. Continue the show. So many of my favorite Sci-Fi shows have been cancelled I have started to take it personally. Yeah, but they know this is the last season so it should end cleanly… And not every show is suppose to last ten seasons. I feel four is good. Better to go out on a highnote than to stick around too long. The ratings for the binge-a-thon were abysmal. Under a 0.10 per episode. The ratings dropped every single season. I hope you are correct, and it goes out on a high note.